How to Make your own Herbal Spring Blood Cleanser. CLEAVERS or more commonly known in New Zealand as BIDI-BIDI. The leaves of Galium aparine grow in whorls of 4 – 8 around its stem, which can grow to 6 feet long. The plant’s sticky nature comes from tiny hooked hairs growing out from the leaves and ridges of the stems. It produces tiny greenish white flowers from November to April. Seeds are set in small sticky hairy burrs and can remain viable in soil for up to 7 years. The sticky hairs enable Galium aparine to grow upwards by clinging to other plants and fences. They also assist in seed dispersal. Cleavers are held in high esteem as a spring tonic. The herb is said to promotes lymphatic flow, to be cooling, soothing and cleansing. It is best harvested when young and prolific from early September. It can be added to salads, though the hairs give an interesting effect, or cooked in a little water as a leaf vegetable. Historically cleavers are seen as a wonderful cleansing remedy, clearing toxins from the system and reducing heat and inflammation. Cleavers has a diuretic action, aiding elimination of wastes, and also acts to enhance the lymphatic system, promoting lymphatic drainage of toxins and wastes so that they can be excreted via the urinary system. These actions combine to make cleavers excellent for fluid retention, skin problems,. Including eczema, psoriasis, acne, boils, abscesses, urinary infections. urinary stones and gravel, arthritis and gout. Cleavers can be used for lymphatic problems, such as lymphatic congestion and swollen lymph glands, congestion of the breasts, and is said to have anti-tumor activity, particularly when in the skin or breasts, and the lymphatic system. 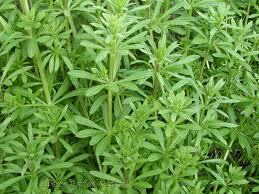 Cleavers has cooling properties, reducing fevers and resolving eruptive infections such as measles and chicken pox. Cleavers cools heat and inflammation in the body, seen in conditions such as cystitis, arthritis, inflammatory skin problems and digestive problems. Its bitter properties stimulate liver function and enhance digestion and absorption. A cooling drink made of cleavers was traditionally given every spring to "clear the blood". The fresh leaves can be applied to cuts or wounds to check bleeding and speed healing. The juice or an infusion can be used to bathe varicose ulcers, or the fresh leaves can be made into a poultice. Cleavers will soothe and cool burns, sunburn, inflammatory skin problems such as eczema and acne, and clear the skin of blemishes. Recipe for Cleavers fresh plant juice & Dandelion (Taraxacum officinale) decoction. Harvest 100g of root plus leaves. You will have more root than leaves at this time of the year. Chop roots into small chunks ( pea sized ) and then place root pieces and leaves into a pot.Cover with 1 litre of water and simmer for 20 mins. Now you have your decoction, which you can add to your cleavers juice when it has cooled down. The dose is 10 to 20mls two to three times daily. Keep in the fridge and consume within the week.